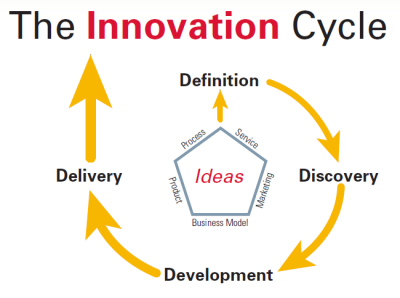 Innovation starts with defining what you want to do, discovering new stuff, developing it and finally delivering it. It's hard for me to talk about innovation until it's delivered for one reason -- I have little to ZERO IDEA what's happening with innovators during the first three stages. Those are all top secret information. You don't want the secret behind your innovative mind leaked out and exploited, would you? I have to wait until I see the final product and experience it in action before I can really talk more of how good or bad a new product or service is. I could only say right now, "Oh that's a cool concept." though there's the concern of does it deliver good results or is it well-implemented? I could go ahead and read all the scanned catalogs of upcoming products and services. I can't comment how good or how bad the final product is without experiencing it beforehand. Just think about the situation -- you can't appreciate a new highly improved vacuum cleaner or properly point out its drawbacks until you've tested it first, right? Research and Development can't get proper feedback without the customers experiencing both the good and the bad. I couldn't tell that what's new delivers results without seeing it in action first. How can I appreciate an electric vacuum or water filtration system without testing or see someone show how impressive it is? A new water filtration system is created and a scientist must verify its results. He gets some tap water which is presumably full of bacteria AND we see how the water got purified as a result. I'd like to see or experience how this new vacuum works wonders such as faster, easier work with tried and tested results than just see the magazine scan's claims first.